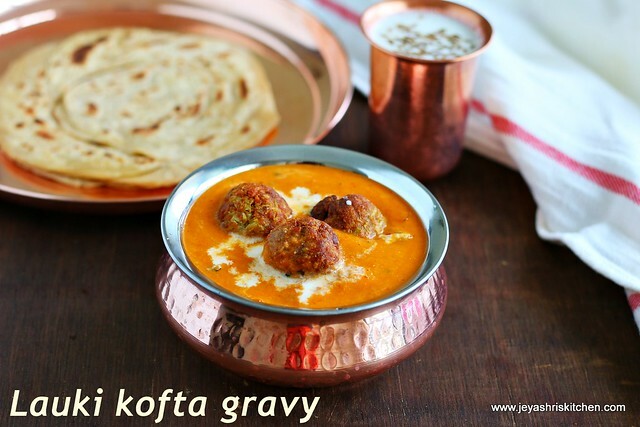 Lauki kofta gravy is a tomato based creamy gravy pairs well withe roti | jeera rice . Lauki | bottle gourd| sorakkai| dhoodi, it's a very healthy vegetable and lauki koftas are very popular too. I tried this lauki kofta 2 weeks back, when my friend and her mom visited us for lunch one day. I couldn't click pictures of the kofta curry on that day as i was in a hurry to finish my work. This is a healthy version of koftas which is not deep fried but cooked in appe pan. Check out the detailed post on how to make lauki kofta curry with step by step pictures. Peel the skin of the bottle gourd | lauki and scoop out the seeds. Use only the flesh part and grate this in a grater. Squeeze out the extra juice from the grated lauki. Press this hard and extract the extra juice. By doing this you can get rid of the moisture and get perfect koftas. The juice you have extracted can be added for making chapati dough. Or you can add salt and pepper powder to this and drink it as such. Also can be used for making south Indian rasam too. Add the squeezed lauki to a wide bowl. Add red chili powder, besan, cumin powder, coriander powder and salt to this. Mix well and make this into a whole mass. Do not add any water. If you feel the dough is sticky you can add 1-2 tblsp of besan | kadalaimaavu to this. Grease your hands with oil and make this into equal lemon sized balls. Roll this on the rice flour and keep aside. The purpose of rolling it in the rice flour is to keep the lauki kofta balls firm, so that they won't disintegrate while deep frying or shallow frying. I cooked the kofta balls in appe pan | paniyaram pan. Also i tried deep frying method too for 2 koftas. The appe pan method took s little extra time but it is healthy. If you are deep frying, keep the oil hot and bring the temperature to medium and fry the koftas. Frying in high flame will not make the inside portion cooked. If making in paniyaram pan, add few drops of oil and place the koftas into that and cook on all sides. Do it in a medium flame so that the inside will get cooked. Chop the onions and tomatoes finely. Peel the skin of garlic and ginger. In a pan add 1/2 tblsp oil and add in the red chili,cashew nuts,star anise,cinnamon, cloves, ginger and garlic. Cook this for 2 minutes and add the finely chopped onions. Once the onions become translucent add the tomatoes. Cook till the tomatoes become mushy. Allow this to completely cool and grind into a fine paste. Add 1/2 tblsp oil in the pan and add the ground paste to this. Cook this for 2 minutes. Be careful and keep the flame in medium, the gravy will splutter. Add the red chili powder,salt, cumin powder, coriander powder an garam masala. Add 1 cup of water to this and add the kasoori methi to this. Let this boil for 5 minutes in a low flame. Stir in between. Add the fresh cream to this and mix well. Add the kofta balls to this. These kofta balls be added 2 hours before serving, so that the flavour from the gravy gets infused into the kofta balls. 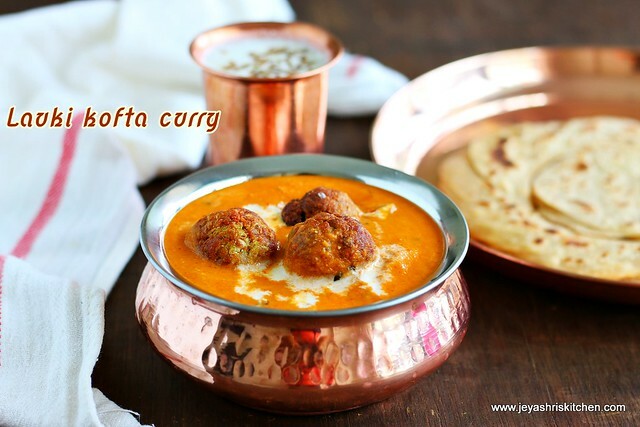 Serve lauki kofta curry with roti | paratha. We had with lachaa parathas and masala chaas. Squeeze the extra water from the grated lauki by pressing it hard, else the koftas will get disintegrated in the gravy. You can stuff a piece of cashew nut in the middle of the kofta too. also few people add raisin too. Instead of besan you can add 1-2 mashed potato or 1/2 cup of grated paneer. Instead of fresh cream you can add 1/4 cup of full cream milk too.